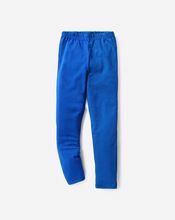 Fabric used is cotton/stretch which gives maximum comfort to the kids also atmost care has been taken during sewing to ensure 100% comfort to wear. 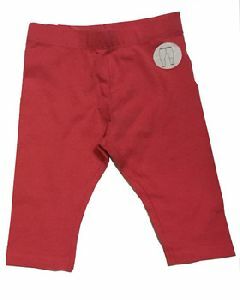 We have Original Branded Kids Leggings from age 2yrs -14yrs. Available in Printed, Plain, Lycra. Surplus branded MOQ : 5000. Tax and Transportation extra. 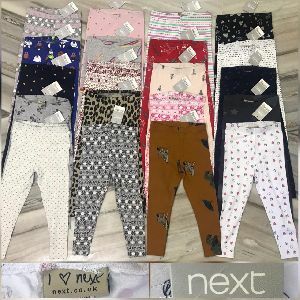 Well-known Suppliers of Kids Leggings; we are reckoned for the exceptional range of products that we offer. Capitalizing on an efficient industrial network, our organization has made coalitions with numerous reputed logistics solution sources. Thus, we can ensure on time distribution of consignments. 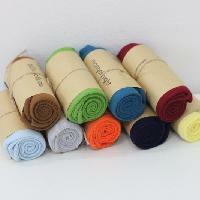 We make available Kids Leggings in varying colours and sizes. Association with trusted vendors enabled us to meet the quality expectations of the clients. We source only premium-grade raw materials from the reliable sources after complete checking. We are committed towards providing quality-assured products to the customers and thus we check them stringently before making the final dispatch. 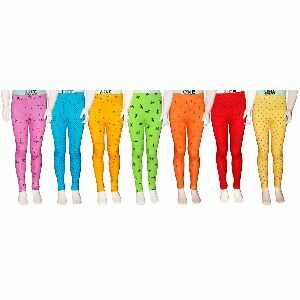 We are well-known Manufacturer and Supplier of Kid’s Leggings in West Bengal, India. Our leggings are made using premium fabric ensuring longer life and excellent quality. 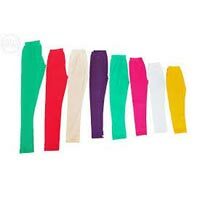 We provide leggings in attractive colors and sizes in order to meet the diverse demands of buyers. 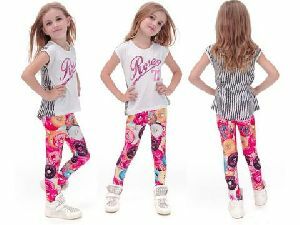 Our Kid’s Leggings can be worn with printed tops and t-shirts. 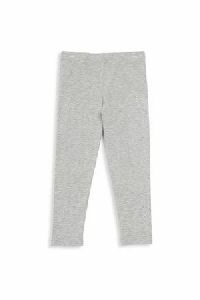 We can provide Kid’s Leggings in both small and bulk quantities. 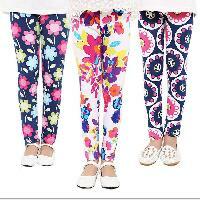 Get elegant collection on Kids Leggings made using high quality fabric. 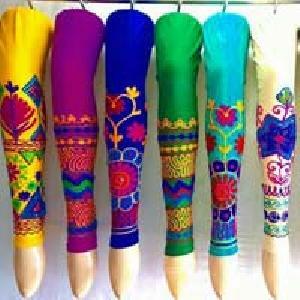 Kids Leggings offered by us are available in more than 10 colors and various patterns such as plain, printed etc. 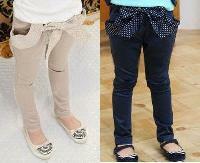 Trendy and stylish by looks, these Kids Leggings are made using stretchable fabrics. 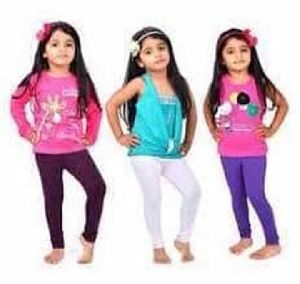 Fine stitching quality, availability of different sizes and most competitive price make our Kids Leggings highly demanded in the market. Cotton leggings are fashioned using cotton fabric, which is greatly appreciated for its smooth texture, anti-piling, & shrinkage properties. Smartly designed, our cotton leggings can be mixed and matched with kurtis, tunics, and long shirts. 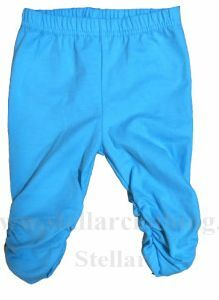 We offer cotton leggings in different colors, sizes, waist sizes, and length to cater diverse requirements of fashion-oriented girls. 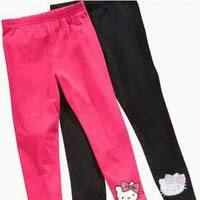 We are one of the leading Manufacturers and Suppliers of Kids Leggings . 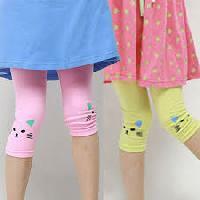 We offer a wide range of Kids Leggings in various attractive colors and shades. 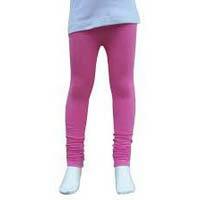 The Kids Leggings supplied us by are fabricated using smooth and skin friendly material. 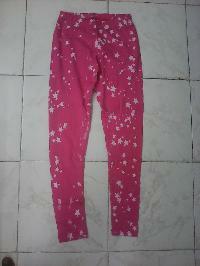 The Kids Leggings are extremely comfortable to wear, stretchable, colorfast and can be availed in different sizes. Ramoni Garments Merchant Pvt. Ltd.
Comfotable cosy, shiny, beautyful, colour leggings.four way strech.